TICKETS ARE NOW AVAILABLE at THE INDEPENDENT Box Office 628 Divisadero Street. Dragon Smoke is a band that formed as part of Boom Boom Room Presents' New Orleans Jazz Fest tradition known as the “Superjam”. The “Superjam” idea is to put together a band of people who don’t normally play together and see what happens. With the dual vocals of Neville and Lindell, matched with the Galactic rhythm section, the band quickly realized, “We are on to something”and has played every Jazz Fest since it’s inception in 2003. This inception took place at the famed Dragon’s Den, hence the name of the band. The music centers around Lindell’s blue eyed soul , Neville’s funk and R&B, and Galactic’s groove. Besides a few trips to the West Coast, this band has been strickly playing in New Orleans. With everyone in the band being a leader on their own, it is rare to get this band together. And when it does, it shows that these guys are really having FUN! 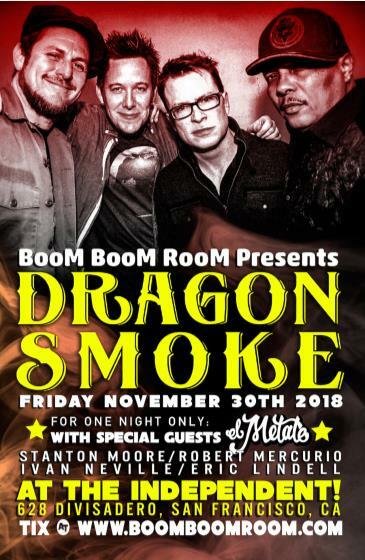 From the interplay between the members, you would think that Dragon Smoke has been playing shows forever. El Metate is a psychedelic space-funk collective from San Francisco that formed in the summer of 2013. Their recorded body of work runs the gamut from soaring, guitar-fueled originals that recall Soulive and Boogaloo Joe Jones to reinterpretations of rare groove classics awash in a psychedelic haze of Hammond Organ and Fender Rhodes. On any given night - be it a sojourn down the coast to some of the western seaboard's most storied musical outposts, or an all night, postmodern/pre-apocalyptic space odyssey in their hometown of San Francisco - El Metate is a band possessed.After headlining sold-out shows to enthusiastic (if not rabid) audiences and sharing the stage with Monophonics, Tea Leaf Green, Robert Walter's 20th Congress, Con Brio, Wil Blades, and members of Lettuce, El Metate has begun to take the show on the road.